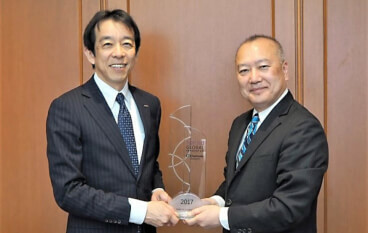 OMRON Corporation (Headquarters: Shimogyo-ku, Kyoto; President and CEO: Yoshihito Yamada) has been selected as one of 2017 Top 100 Global Innovators by Clarivate Analytics for the second consecutive year. On April 9, 2018, Clarivate Analytics visited the company headquarters to present the trophy. Clarivate Analytics selects its Top 100 Global Innovators based on their proprietary intellectual property and patent data. This global information service firm analyzes intellectual property trends using an independent index in order to identify the world's most innovative corporations and research institutions and then recognize them. Candidates for this award are evaluated by analysis based on Clarivate Analytics’ database in terms of four main criteria: volume, success, globalization, and influence. Among these criteria, OMRON was rated particularly high for globalization, which is determined by the number of basic patents obtained in the four major world markets (U.S., Europe, Japan, and China). In 1959, our founder Kazuma Tateishi established the company’s corporate motto, "To improve lives and contribute to a better society." True to this motto as its spiritual cornerstone, we have since created numerous innovations and pursued new challenges by making continued efforts to develop better social infrastructures. Going forward, in order to continue contributing to a better society, we remain committed to developing its intellectual property strategies in close collaboration with its business and R&D teams. We are truly honored to be recognized among the “Top 100 Global Innovators” for our second consecutive year. Our goal is to become a company that makes its presence felt and gains the trust of people the world over by solving global social issues through our business. Toward this end, we are rolling out intellectual property strategies in tandem with our business and research and development strategies. In FY2017, we mapped out such intellectual property strategies for each business by expanding their scope from individual products to the entire business segment and then filed patent applications accordingly. We also kicked off a unique in-house training program entitled 'Patent Dojo' in FY2016 so that we can help our engineers to improve their patent-related skills and motivate them to have their inventions patented. In order to maximize our corporate value, we will continue to create high-value-added technologies and business models that strengthen the competitive edge of our business. We will then protect and make efficient use of them as intellectual properties in the form of patents, trademarks, and knowhow, thereby achieving earnings and business growth. Clarivate Analytics uses patent data to analyze intellectual property trends and select the top 100 innovative corporations and institutions around the world annually. The 2017 Top 100 Global Innovators marks the seventh year of the awards. Based on rigorous and objective data extracted from the Derwent World Patents Index (largest value-added patent database in the world) and Thomson Innovation (intellectual property survey and analysis platform), as well as independent assessment standards, the award is given to companies recognized as being innovative, being striving to comply with intellectual property rights protection conventions and having brought about world-influencing inventions.